Susuwatari, meaning "wandering soot" in Japanese, or simply soot sprites or dust bunnies in English, are little spirits created by Studio Ghibli co-founder Hayao Miyazaki. They make appearances in the animated films "My Neighbor Totoro" (1988) and "Spirited Away" (2001). In the former, they live in an old house that has been uninhabited for at a least a little while before the movie begins. When the new tenants move in, a father & his two young daughters, the soot sprites are discovered by the children in the dusty attic. 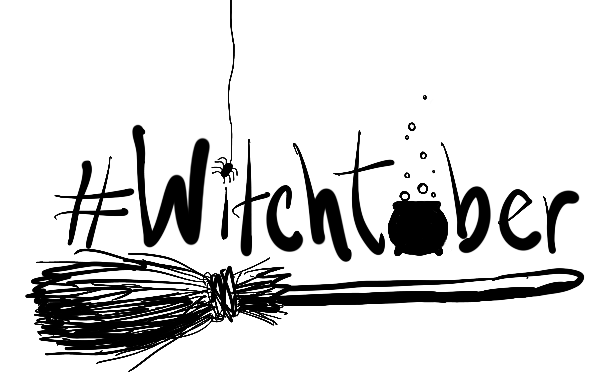 The family then good-naturedly prays for the spirits to move on, as the house is now occupied, and, after holding a meeting, the soot sprites float away during the night to find a new home. In "Spirited Away" the soot sprites live in the boiler room of a massive spirit bathhouse and are alive thanks to an animation spell cast by the boiler room worker Kamaji. The sprites are very strong and their job is to carry the coal that feeds the fires that heat the water for the bathhouse above. If they don't do their work then their purpose goes unfulfilled and the spell wears of. Whereas we don't know what the soot sprites in "Totoro" eat, or if they eat, the sprites in "Spirited Away" are fed konpeitō (kon-payee-toh), a type of colorful sugar candy introduced to Japan by the Portuguese in the early 1500s. When the sprites first meet the main character Chihiro they are frustrated with her for disrupting their work, but later on, after they see her literally squish a powerful spell, they cheer her on and support her in her adventures. I bought this 140gm bag of konpeito on Ebay (click here). Note: You can use black sugar instead of chocolate jimmies to cover the cookie pops, but I went for the jimmies because they taste good, are more pokey looking, and the black sugar I bought at Michael's was actually dark green when I poured it out. So, poo on that. Also, FYI, check out my soot sprite inspired tea blend on Adagio Teas! 1. Melt the candy melts in a microwave safe bowl or cup in the microwave at 30 second intervals, stirring each time, until fully melted & smooth. Stir in a tiny amount of canola oil to make it more dip-able/spreadable. Carefully separate each cookie so that 1 side has all of the cream. Taking 1 lollipop stick at a time, dip 1 end into the melt & then place the stick, dip-ended, into the center of the cream side of 1 of the cookies. Gently press the sandwich cookie closed & set aside for a few minutes. Repeat until all of the sandwich cookies have sticks inside of them. 2. 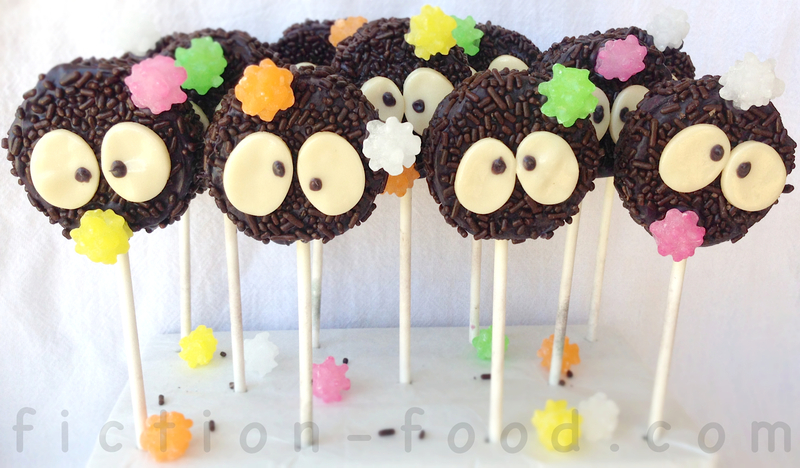 Holding the lollipop sticks, carefully dip each cookie into the candy melt & let the excess melt drip back into the bowl. You can alternately spoon a glob of melt onto each side of the cookie & then smooth it out with a little spreading knife (this is what I did & it worked great). Let the dipped cookies sit upright for a minute in the styrofoam block. Pour your jimmies into a bowl or onto a plate & press the sides & edges of each dipped cookie into the jimmies so they are fully coated. Lay the cookie pops flat on a sheet of waxed or parchment paper. 3. Using your fingers & a small roller flatten the vanilla Tootsie Rolls to about 1/16"& then cut out 24 circles (you can ball up & re-roll the excess to cut more circles as needed). 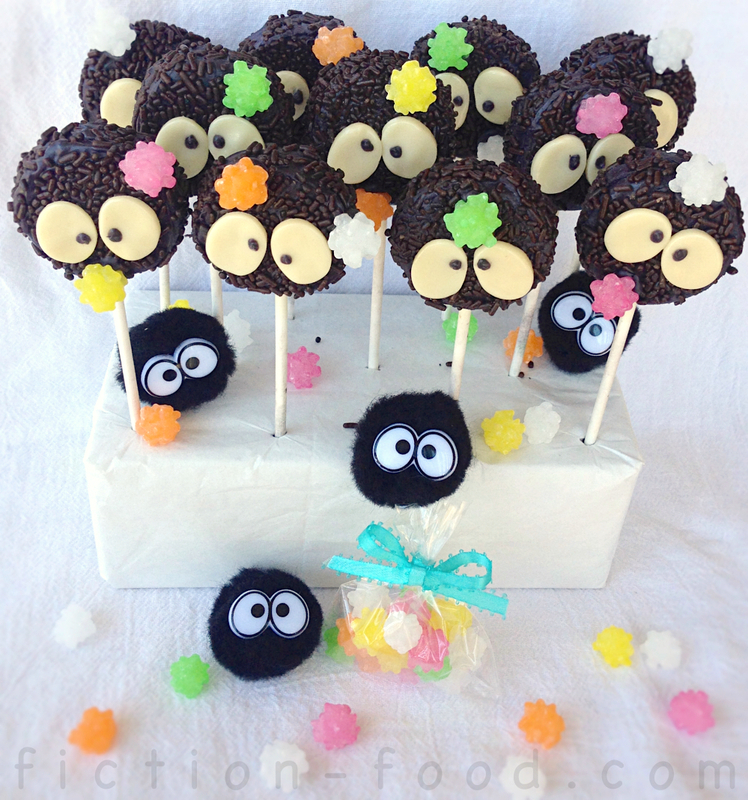 Gently form each circle into a slight oval & then press 2 each onto the cookie pops to make the eyes of the soot sprites. Reheat the melt if needed & then use a toothpick to dab little circles of melt onto the eyes to make the pupils. 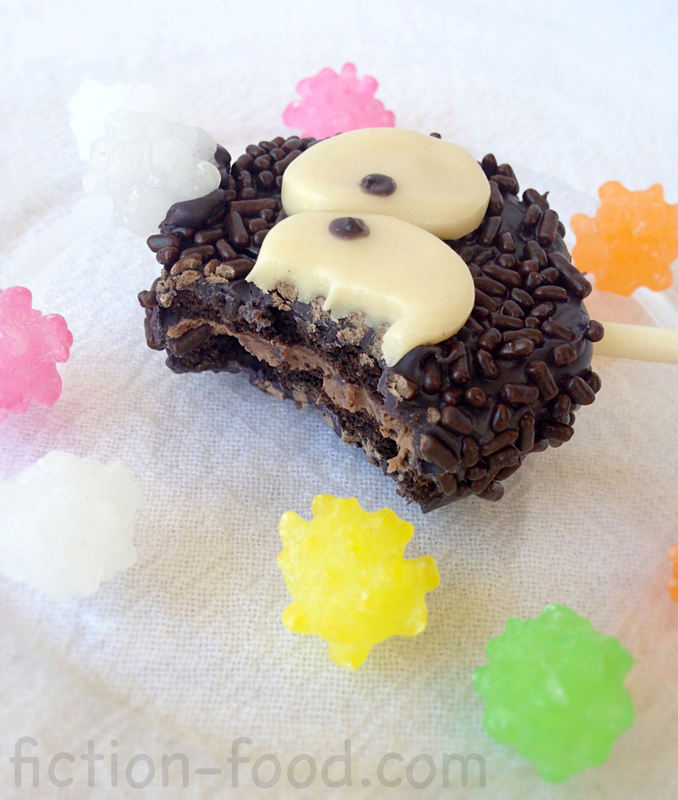 If adding konpeito or stars to your cookie pops, use a dab of melt to make them stick. Let the pops sit flat on the waxed paper for several minutes so the melt can fully harden before standing upright in the styrofoam. 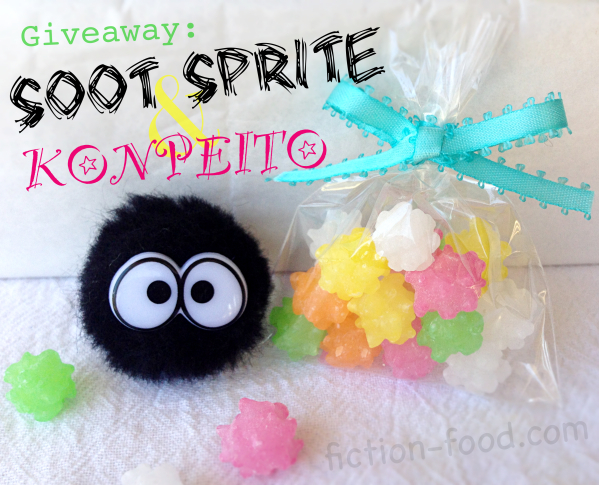 To win this fuzzy little soot sprite & small bag of konpeito candy simply leave a comment below! & include your email address written like something (at) something (dot) com. I'll pick a winner using a random number generator. Open to US Residents only. Ends Monday, July 28, 2014 @ 11:59 PM PST. My favorite is Howl's Moving Castle! I love Soot Sprites! I wish I could have them help ME at home! Oh my gosh! I remember these little guys from My nebroi totro!! I first time I got to eat those konpeito candy after I watch Spirited Away with my brother. 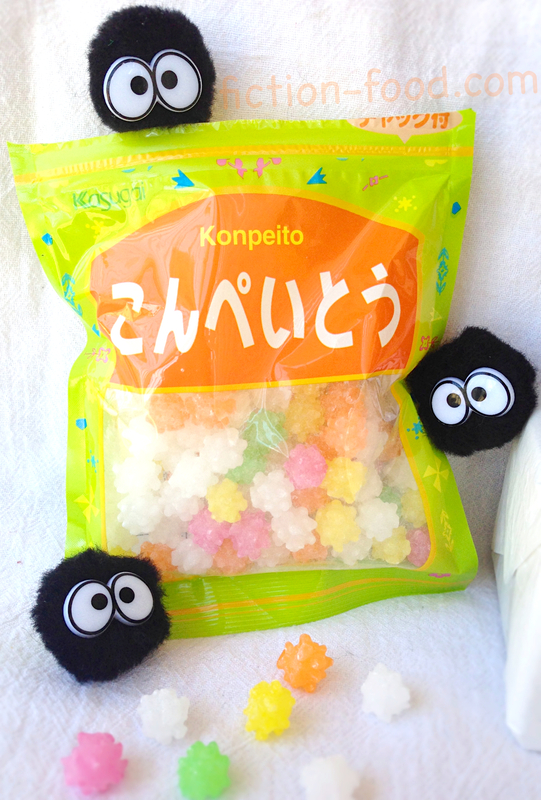 The next day he went out to a store and got me bag of konpeito candy for the soot sprites for my room. I'm total going to mkae thetas for him and send him a bag of konpeito candy just for his soot sprites in his apartment. My favorite Studio Ghibli film is actually Spirited Away, simply because I loved the story line and always felt bad for No Face. It was also the first Studio Ghibli film I watched. Second up I'd have to go with Howl's Moving Castle, because I related to much to Sophie. 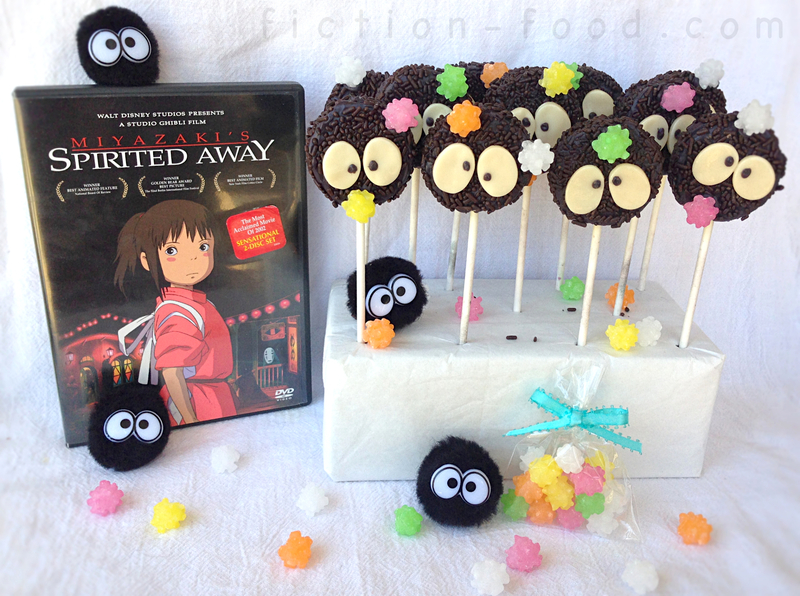 I love Studio Ghibli and my favorite movie is Spirited Away. My favorite is "Spirited Away" for many, many reasons. 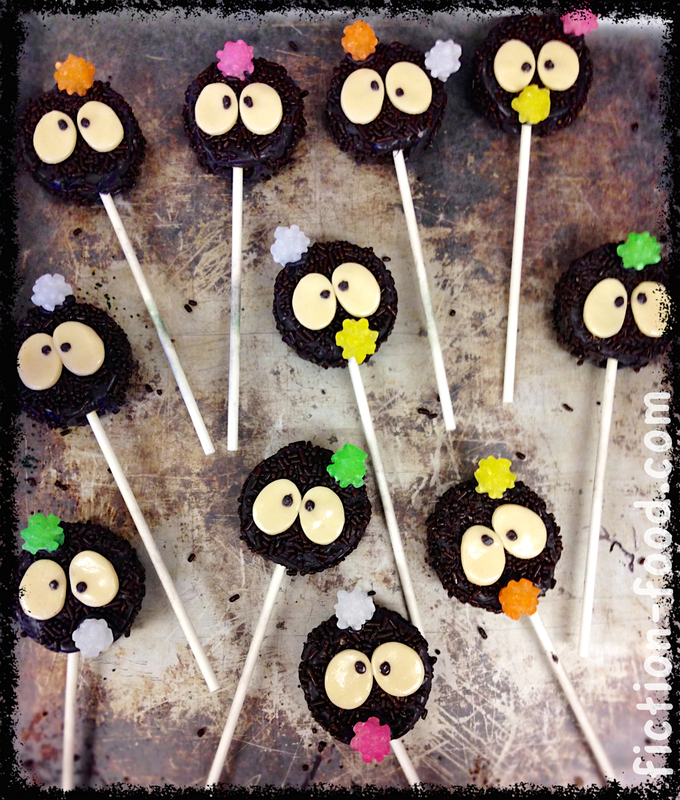 I can't wait to make these cookie pops - they have my incoming first graders names written all over them! Thanks for the opportunity! These look absolutley adorable!! 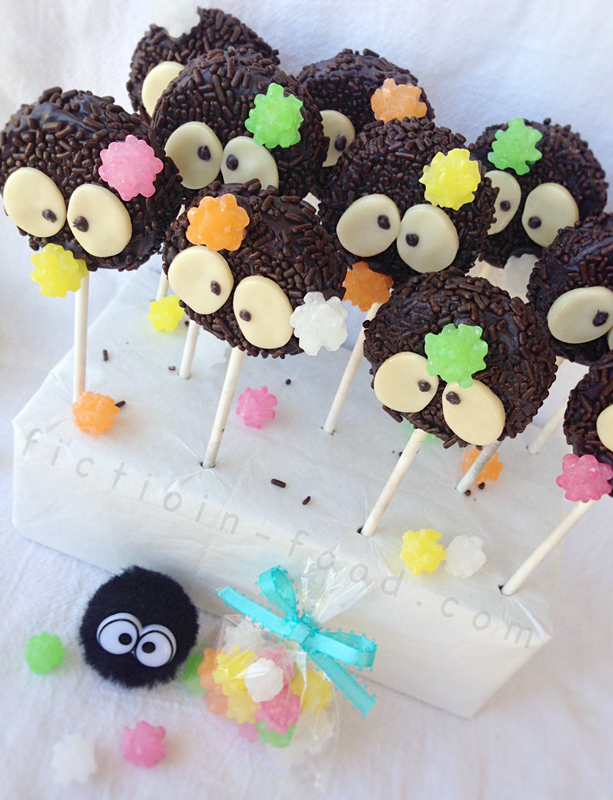 I cannot wait to try making them did a ghibli themed tea party later this summer! My favorite film has always been Kiki's Delivery Service because I always wanted to be a lil witch making friends in the forest, eating pancakes, living over a bakery by the sea, and always accompanied by her little cat!! thank you for hosting a giveaway that is so sweet! 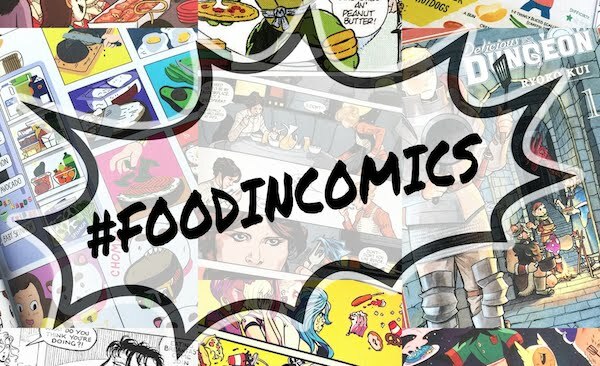 You're Blog and Creations are so awesome! Kiki & Totoro are the most favored at our house. We have baked bread, pot pies and pancakes with Kiki, and enjoyed noodle soup with Pongo. Been doing bento for years. Thank you for the inspiration, she loved your Spirited Away oniguri recipe (I had been using the wrong rice and no salt!). The lunches this year are going to get more fun - and maybe stay together better!